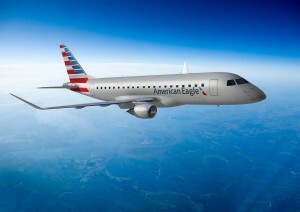 At a ceremony held today at the Company’s headquarters in São José dos Campos, Embraer delivered to American Airlines the first of 60 firm order E175 jets under the contract signed between the two companies in December 2013. The contract also included options for another 90 E175s, taking the total order potential to 150 aircraft. American Airlines selected Compass Airlines, a wholly owned subsidiary of Trans States Holdings, to operate the first 20 E175 aircraft under the American Eagle brand. The E175s will be configured with 12 First Class, 20 Main Cabin Extra and 44 Main Cabin seats, for a total of 76 seats. Embraer is the only manufacturer to develop a modern family of four airplanes specifically targeted to the 70- to 130-seat segment. Since the formal launch of the program, in 1999, the E-Jets have redefined the traditional concept of regional aircraft by operating across a range of business applications. The E-Jets family entered revenue service in 2004. Currently, E-Jets are flying with 65 airlines from 45 countries, holding a 62% market share (based on deliveries) in the segment of jets with capacity up to 130 seats. Today, E-Jets are flying with mainline, low-cost and regional carriers, as well as with charter airlines. In June 2013, Embraer launched the second generation of the E-Jets family – the E-Jets E2 – the first of which is slated to enter service in 2018.